Pages: 10 modules with an average of 30 pages in each. The Central Board of Secondary Education (CBSE) has decided to introduce a new elective course for Std XI, known as Knowledge Traditions and Practices of India (KTPI), available to students from the 2012 academic session under the elective course code number 073. The CBSE's circular said that the newly introduced course "received an overwhelming response from educationists and the teaching community all over India." It aims to engage students with a sense of exploration and discovery while highlighting the concepts and major achievements in various disciplines of knowledge. This elective is keeping in line with the Board's endeavor to develop the curriculum in various subjects with a deep focus on the values inherent in Indian education system. This focus further takes shape in facilitating knowledge of traditional practices through the course material developed for students. The various modules of this course have already been put online and a printed book version is currently under process. The Board is also preparing a Hindi version of the course. The Board has written to principals requesting them to include this elective in their scheme of studies. There are a total of 10 modules being offered by CBSE in this course. At present, the e-book of the course with 10 modules can be viewed on CBSE website. The links to the e-version of modules making up the textbook can be accessed at http://www.cbseacademic.in/circulars2012.html. The circular number is Acad-68/2012. The various modules and their titles are given below. 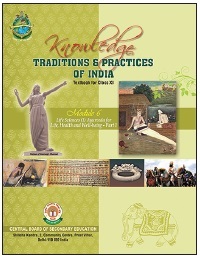 The KTPI is being introduced as an elective subject at the Senior Secondary level. After 10 years of general education, students branch out at the beginning of this stage and are exposed to the rigors of the various disciplines for the first time. This is the stage when they are made to start reflecting over their future life and decide of a career. At this point, they also become aware of certain knowledge traditions and practices of India that are being followed in their families and society around them, but few students get an opportunity to lay hands on the vast treasure of knowledge that lies hidden in the form of literature or books. This course aims at providing a broad overview of Indian thought in a multidisciplinary and interdisciplinary mode. It would not seek to impart masses of data, but would highlight the concepts and major achievements while engaging the student with a sense of exploration and discovery. It would be an introductory course, so that students who take this are prepared for a related field in higher studies in the universities. The course will cultivate critical appreciation of the thought content and provide insights relevant for promoting cognitive ability, health, and well-being, good governance, aesthetic appreciation, right values, and appropriate worldview. The course will, therefore, comprehensively deal with all-round personality development of the students and increase their knowledge about their country. The knowledge traditions of India are continuous and cumulative. They are textual and exegetical traditions in different areas of thought and experience: philosophy, medicine, grammar, architecture, geography, literary theory, polity and political economy, logic, astronomy and mathematics, military science, metallurgy, agriculture, mining and gemmology, and shipbuilding, among others. Concepts and technical vocabularies of these traditions are still a part of the thinking and languages of modern India. The tradition is also non-egocentric - the 5 th century philosopher of language, Bhartrhari, states in his Vakyapadiya a cardinal principle of knowledge constitution: "The intellect acquires critical acumen by familiarity with different traditions. How much does one really understand by merely following one's own reasoning only?" (Bhartrihari, Vakyapadiya, II.484). The traditions are, therefore, intrinsically polycentric; Indian thinkers have constantly engaged in internal debate and dialog and have also interacted with the traditions outside India. paraphrase the ideas of primary text in English or Hindi. India's knowledge traditions and practices in the following disciplines and a few more topics are expected to be broadly covered during the 2 years course of study:(1) Language and Grammar, (2) Literature, (3) Philosophy Yoga and Logic, (4) Fine Arts, (5) Performing Arts, (6) Mathematics, (7) Astronomy, (8) Chemistry and Perceptions of the Physical World, (9) Metallurgy, (10) Other Technologies, (11) Life Sciences, Medicine and Surgery, (12) Environment and Ecology Traditions, (13) State, Society and Ethics Geography and Cosmology, (14) Medicine and Surgery, (15) Agriculture, (16) Trade and Commerce, (17) Education, and (18) Knowledge Creations and Disseminations.